Few things will mess with your favorite barre workout like wearing the wrong socks — slipping and sliding on the studio floor can be a recipe for injury, not to mention embarrassment. But you can save your bum and your dignity by making grip socks a regular part of your barre routine. Grip socks — sometimes called yoga socks or Pilates socks — are similar to regular socks, but their soles are dotted with a soft, rubbery material that provides the traction you need to navigate smooth surfaces with ease. This “grippy” material makes it easier to hold poses when you start to sweat, which is key in a barre class. When you’re powering through a set of deep pliés, you don’t want to worry about your feet slipping out from under you. 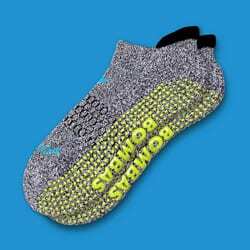 What Grip Socks Should I Buy? As with any essential workout gear, the best grip socks are made with breathable materials, a bit of cushioning, and anti-stink technology. Grip socks can be toeless or closed-toe, cut-out or full-coverage, low-profile or lace-up — so you won’t have a problem finding a pair of grip socks that suit your style. Spoiler alert: We’re partial to Xtend Barre grip socks, which are designed to hold up through an intense full-body barre workout. Grip socks are easy to care for: Simply turn them inside out and wash in a gentle cycle, then dry in low heat. And never iron or bleach your grip socks — not that you were planning to iron your socks anyway. When in doubt, check the tag or the manufacturer’s website for specific instructions. Want to find the best grip socks for your barre, yoga, or Pilates workout? Here are a few of our favorite pairs. The soft, breathable fabric on these grip socks makes them perfect for both workouts and everyday wear. And if you’re not into flashy socks, you’ll appreciate the full coverage, low profile, and basic black-and-white color options. Apex non-slip socks are popular with hospitals, so you know they’re serious about safety — the grippers extend past the heel for maximum skid and blister protection. Amazon.com.